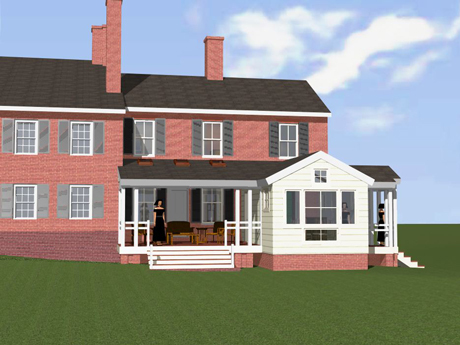 3D Archicad View featuring the proposed Entry Porch. 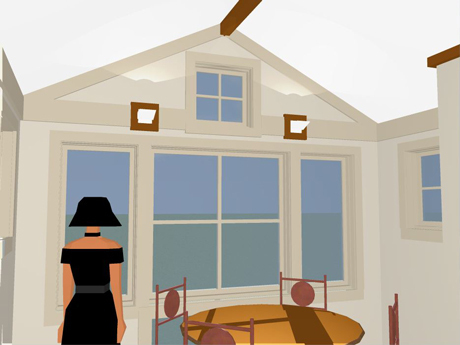 3D Archicad View featuring the proposed River Porch. 3D Birdseye view of the proposed Interiors. The Breakfast Room is set up to enjoy its River Views. 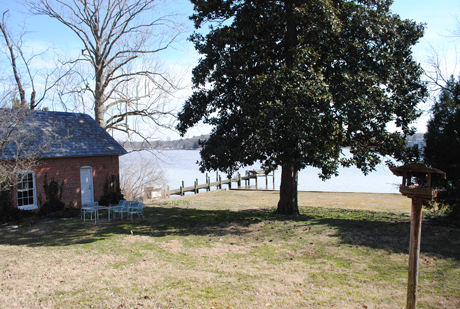 The View of the Chester River from the New Additions. 3D Birdseye view of the Additions. 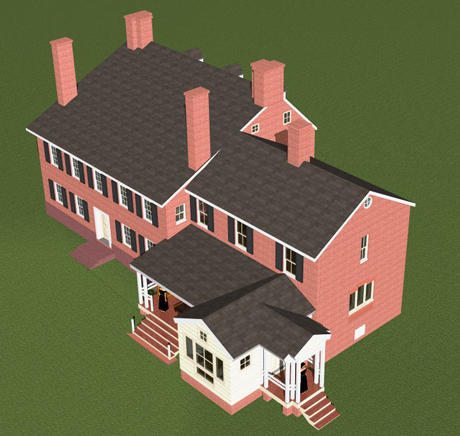 The Riverfront with Smith-Ringgold Additions using our 3D Model. 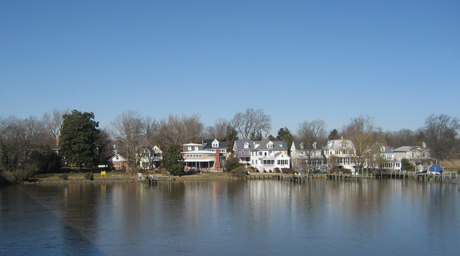 The "Before" photo of the Riverfront, into which we inserted the 3D model. 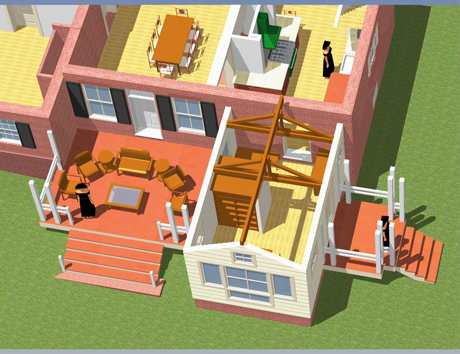 we use, ArchiCad, which is heavily used in Europe and Australia. participate in steering the design to achieve their purposes. For some insight into how Chestertown's 1700s Town Plan was laid out to promote commerce, religion, political control, and taxes, see this video. The new Owner told us "This historic house makes me happy as it is." "It is remarkably pleasant and livable," she said, "with lots of light. With a few exceptions, I wouldn't make any structural changes to the floor plan. I want to respect the house, keeping as many original bits and details as we can." There are only a few things she found missing. The kitchen is isolated and dark. There is no place for an intimate breakfast. The Owner's entry needs a closet. There is no outside space to sit and enjoy the river. The difficulty here, is to find a way of addressing these modest needs, such that the new additions are architecture, compatible with the historic. 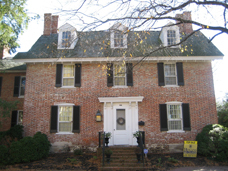 The Smith-Ringgold House is one of the most prominent historic structures in Chestertown's National Register District, and even more prominent among the structures which compose Chestertown's riverfront. Anything we propose will get the Historic District Commission's severest scrutiny. > The additions do not involve the removal of historical features. > The additions will only "lightly touch" the historic fabric. Except where closure is required, the new construction takes place away from the historic. > The historic masonry remains intact; no new finishes are needed. All historic windows and doorways are preserved. > In some future (hypothetical) era of restoration, our new additions could be removed without damaging the historic fabric. > In comparison with adding a wing to the end wall of the 1860's gable, our proposed design keeps the landscape as open as possible for Water Street's residents and visitors. We are also mindful of the Historic District Commission's (HDC) over-arching principle: New construction must be recognizable as such. Contemporary design is most appropriate. In any case, new construction which appears older than it is, that is forbidden. How are we to get the HDC's permission? 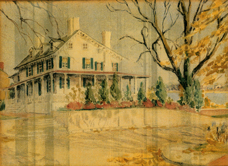 The original house was built in 1760, and had a catslide addition built toward the river, and doubling its size. The extent of this construction is testiment to the profitability of the owner's business. He ran Chestertown's ferry service, which landed on high ground, at this site. Much of Smith-Ringgold is 19th Century construction. 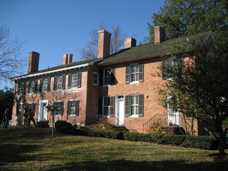 However, in the 1970's the Smith-Ringgold house was thoroughly reworked to appear as if it is all an 18th Century Georgian mansion. 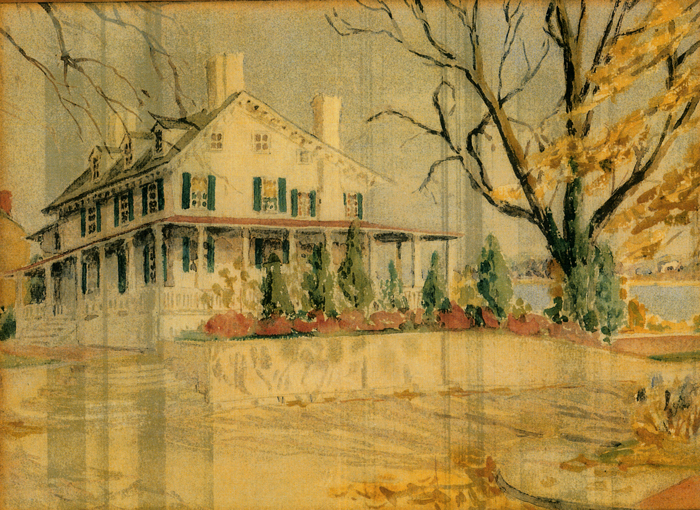 To bring out the truth of Smith- Ringgold's origins, we assembled the architectural and photographic evidence available into a set of drawings, that illustrates the history of its various building periods. Among the images we included in this historical analysis, is the one (below) which shows Smith-Ringgold in its early 20th Century glory. Smith-Ringgold is not really the Georgian Mansion it is pretending to be. 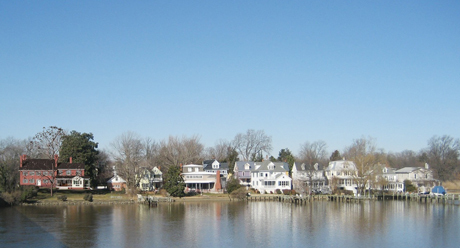 It is a much more interesting aggregation of 18th, 19th, and 20th Century architecture, which illuminates Chestertown’s social, cultural, and economic history. 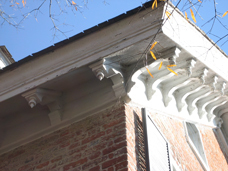 For example, the two authentic 18th Century portions sport the 19th Century Italianate Cornice shown below. This Cornice dates from the 1860’s remodeling, as does the wrap-around porch shown in the painting above, all of the exterior doorways that still exist, and numerous windows, not to mention the 1860's wing. As our historical analysis shows, the Smith-Ringgold House still has many features from its glorious 1860 incarnation, although the 1970’s "georgification" recast them into obscurity. It’s hard to remember how much Victorian architecture was disrespected back then. 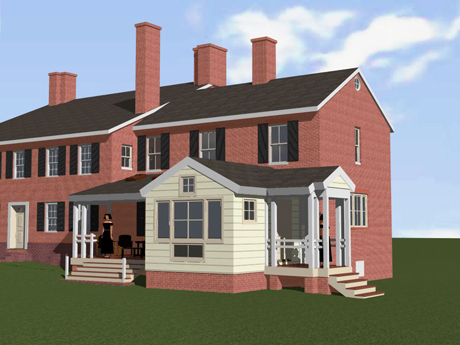 In fact, the "Georgian" wing where we are proposing additions is a Victorian addition (1860's) and originally stuccoed. It was stripped to bare brick in the 1970's to seem like a Georgian wing. Our historical analysis makes the point, the 1970’s “georgification” is itself a remodeling, a fourth building period, which is now another interesting episode of Smith-Ringgold's history. In our opinion, there are many keys to our getting HDC approval for the Owner's additions. 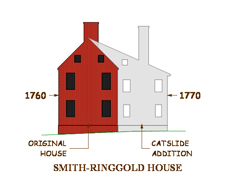 First, we had to illustrate the truth of Smith-Ringgold's historical origins, including that it's 1970's "georgification" is itself a (fourth) building period, and not an authentic restoration. Otherwise, the HDC might not have recognized Smith-Ringgold as the quirky eclectic character it is. We made the point, our proposed additions will continue that eclectic heritage. We pointed out that the brick steps we would have to demolish (to build the additions) are not Georgian. They are an inappropiate 1970s "early-ing up" of an 1860s Victorian wing. In our historical analysis, we included a photograph which shows the 1860's wing originally had a porch where we are now proposing (porch-like) additions. We explained the owners needs are modest, and so are the additions. We explained how we had planned the construction of the additions according to the Preservation Principles listed above. We needed all of these keys to open the door to accomplishing the owner's objectives. When the HDC held their hearing, one of their number put forth a challenging question before we had even made our presentation: How are our additions appropriate historic preservation? We answered that by reading from our drawings, the Preservation Principles listed (in Italics) above. With that key turned, we presented our historical analysis. The HDC began their deliberations by discussing, not whether it was acceptable to make these modest 21st Century additions, but whether our contemporary windows were compatible. Our documents and presentation had convinced them our additions and the demolition are appropriate. They had moved on to the details. Some thought: no, our windows were too contemporary. Others pointed out how many different types of windows Smith-Ringgold already has, (from its many different building periods). In the end, the HDC approved the additions as submitted, agreeing our additions are yet another building phase in the fascinating history of this eclectic structure. They illustrate the needs and wants we have today, in the first quarter of the 21st Century.